Any 7th-12th grade interested in running cross country can begin running with the team now. Practices are held Monday-Thursday 6:00 p.m. (until Aug. 14th) at the Wellness Center parking lot. A sports physical is required to participate. For more information contact Pam Chickering at pamela.chickering@kcsdschools.net. 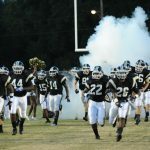 Good Luck to Varsity Football as the team travels to Marlboro County for a two-day competition. New members of the Bulldog Football staff are: Aaron Mayes (Sub-Varsity; Defensive Backs and Wide Receivers); Rick Norred (Defensive Line); Kelvin Whitener (Wide Receivers).